Thanks for the heads up Josh. Those should be fixed now. The Retina (both jpg and png) version of this image is Poseidon instead of An Octopus's Garden. Just thought I'd point that out. This is an impressive background. The colors are vibrant and blended very well and there seems to be a flurry of activity in the background. Ryan, I really like Octopus's Garden and your other underwater images. Have you ever thought of doing one of a kelp forest? I definitely like the idea of some more Winter / Christmas themes next. Count me +1 on the notion of something cheerful as opposed to just dark and cold too. In Colorado, we have gorgeous winters and we also get sunshine an average of 320 days per year. So, something mountainous, sunny (or at least makes you feel warm inside - kinda like a good cup of hot chocolate), and Winter / Christmas would be great...! All your work is wonderful! I wonder what your version of a snowperson or snowpeople would be? How about a "daytime"/bright Christmas scene? Most of your Christmas scenes are on the dark side. Perhaps a majestic, mountainous snowscape/icescape with placed ornament(s) (or any other symbol of the holidays) placed subtly throughout the scene. Nice improvements on Octopus's Garden. As always, you've exceeded my expectations. So now the challenge is a holiday 2011 theme or two. Maybe its time to immerse yourself in some musical Transiberian Orchestra to stimulate your abilities...but as always; your choice to to taunt us with your creations. Some more fall colors. I loved your last piece with the changing tree but I'm not ready for fall to be over! Have you ever done a fall scene as a planetscape? First off, I want to say that the widescreen of Octopus's Garden looks really nice. Somehow it looks like it has more depth than the regular size. Secondly, I would like to see a winter scene next, maybe a Christmas one, and something very unexpected to follow. Maybe pick something you don't have as many wallpapers of, or any at all. Something like a desert, a cave, a floating castle, who knows? Just get creative. I used to dish out 10's all the while then I discovered you kept getting better. For this you can have a 10. Easily your best work so far in my opinion. Wouldn't be the same holiday season without a new DB Christma scene! You've had some great ideas for images. The latest is very well done, but doesn't work for me as a wallpaper because of everything going on (my eyes have a tough enough time sifting through all the icons on my desktop). How about a darker, broader, winter scene with the "wow factor" being more camera angle or shot set-up, than quantity of content? Just a thought. I love the winter ones! Perfect. Thank you for making those alterations! This is the best one Ryan. The muted colours and less animal life make it less busy. These changes were exactly what this image needed; it is now awesome! I love it! Thank you so much for making the changes! Version three looks great! It it is the best of both worlds, more fish, more calm. Who is ready for snorkeling? Version 3 seems to be the best balanced of the three... the amount of fish in version 2 was a little too overwhelming, and the coral in the foreground seemed washed out. I still feel the lighting in version 1 is the best. It's been a while since you published a "habitat" rendering (Biodome/Atrium, Temple of the Leaf, etc). With the new software I'd be curious to see what you might invent with an underwater habitat. Can we please get Lossless 1920x1080 wallpapers? Hi Ryan awesome image as always. Just posting to say that the pickle jar link is missing. Seriously, wonderful work, Ryan! You've done it again! #3 is the most realistic out of all of them. 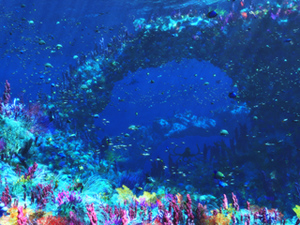 Despite the amount of color coral has, it's not the neon of #2 so much, especially under 40 ft of water. v3 is by far my favorite. Awesome corrections! Personally I prefer the colorful version #2! The octopus new look is great, but the corals #2 are much better. I like how we can see the details of the Octopus now and the color is much better :) awesome. "That's what I like about English. It's all about personal preference. Unless you do it wrong. Then I will destroy you." Love it, Ryan! The changes are exactly correct! I've added a new render this evening with a new sun angle and some strategically places shadows in the foreground. I've also removed about half of the fish. That's what I like about English. It's all about personal preference. Unless you do it wrong. Then I will destroy you. Love this one, very calming, and peaceful. Second version, I like, but it is just a bit busy for my taste. Good work! Hey Ryan - There's something different about the noise level and color saturation from the first version to the second. In the first version, you definitely get the feeling of "floating particles" like there would really be underwater, but in the second version it's almost too strong and ends up feeling like digital noise. Also, the colors feel overpowering in the foreground corals. Almost like they're getting overexposed. And the color balance feels off somehow. Finally, the angle of the light in the first one was more interesting to me, it created a neat effect on the rear arm of the reef with the light playing on the corals in the background. I love the first one, even without all the fish, so thanks for another amazing piece! ryan - just a quick note from my eyes. my eyes seem to be pulled away from the entire image by the brightness of the vegitation on the bottom left. in your first verison the image had more eye flow. Gosh, this would be so awesome as a screensaver! Great work - hoping to have the dual screen versions soon so I can put this one up. Please - hurry up and make the dual monitor version of both versions. 2560 x 1024, por favor. Can't wait to put them up. The extra "s" is acceptable when added to a singular word already ending in "s". I just copied the track name from iTunes so if I'm wrong Ringo was too. dbn's got the right of it. You have the theory correct, but when a singular word naturally ends in 's', and you're trying to assert ownership, you only need to have the apostrophe there, simply because having "s's" looks pretty daft. Don't want to be the grammar nazi, but I would say that the title should be "An Octopus' Garden." :) Really enjoy your work Ryan, keep on truckin'. This looks beautiful. My wife loves it. Normally you post links for a 2560x1440 jpg version that isn't available this time. Will you be adding that later? Thanks for all your incredible work. So sad you lost the file, I really like Neptunes' Garden, the filtered sunlight, not too much contrast, soft coral. I am using it now, just wish we all could have seen the 100%! Long time fan, love your work. On some things. The foreground lighting in this is very bright, and the background very dark, and even with the lossless version I just feel like it's too grainy and loses a lot. I realize atmospheric distortion occurs over distance, but this seems a little extreme. Then again, Chris B might not have made that point at all..
Yeehhhh I think there are too many fish in this one. Maybe if you grouped them together in schools, rather than having them all scattered, it would work better. ... not that the original wasn't great, too. Being a diver, this is the way I wish all my dives looked! Looking forward to the multi screen versions! I love this one alot. It has great visual balance (as do most your works), nice vivid colors, and clever use of lights and darks. Its a nice break from the winter/fall scenes you've been doing lately too. The only criticism I might have is that I can't see my icons as well when this is set as my desktop, but other than that this is VERY well done. However, I like the coloring of the first one better, this version seems too bright, like it's loosing a lot of the finer details in the coral due to the brightness. There isn't too much going on, that's how the the reefs usually are. You could break them down more into schools with some parrot fish & angle fish added in. A golden grouper might be cool, they look bright orange and really stick out. Might want to add some sea anemones for nemo, the nudibranchs always look awesome, though they're tiny. Maybe some Conches. Awesome work as always. I think it would look a bit better if the foreground flora were toned down a bit. I absolutely love how active and lively this scene is for an underwater scene, usually underwater and island and anything tropical is very serene and relaxing but this just makes you want to dive in and have fun! Nice change of pace for the Autumn/Winter Season :D, Thanks Ryan! dunno what I thought you were going to do with this--but it passes ALL my expectations!!!! I like the most of the sea life (especially the octopus), but I think the fish are too spread out all over the place (it just looks like a whole bunch of specks). I think some of them would look better as more concentrated schools of fish. And I don't particularly like the foreground; it looks even more washed out than the first version (I think it has too much bright light blue/turquoise). Please, please do a revision because I really really like underwater scenes! I like them both evenly. If my opinion mattered I would add some sharks. Too busy? Nah that's not what I think. I'm sure you will incorporate all this feedback and wow us yet again Mr. Bliss. Thank you for including us in your creative process. Agree with some others that posted, a little to busy with the fish. Less is more. i'm impressed you re-created the whole scene, Ryan, but i'm afraid i agree with the others - despite the new version having more content, i can't help feeling it lacks *detail*; the original has just the right ratio of detail to content. But congratulations all the same - it seems a bit churlish to critique work of such as astonishingly high standard! Particularly on the left side, the light blue plants don't have much detail. Or rather, the detail is confusing; it's hard to make out what I'm looking at, so unlike Poseidon's Playground, one of my all time favorites. Perhaps a bit more colorful diversity of plants, corals, jellyfish, sea anemones, colorful nudibranchs, etc.? I would love to see a moray eel or two. And since this is an octopus's garden, how about the octopus a bit closer, perhaps some of its tentacles wrapped around the arch? I prefer version 1 over this. As most have said its too busy. Also I think there is too much color. Finally, that Octopus. Really? Overall, a nice wallpaper. However, I have to agree with the others about the first version being better. One of the aspects of the first image I enjoyed was the prominent light rays, less fish and lighter water "color". I do like the addition of the octopus, though. By the way, to deal with any future crashes, I would recommend saving your scene file and every file related to it in another location every time you do a major revision. It wouldn't hurt to verify the backups work either. As someone that's been diving, this seems very busy, to the point it's unrealistic.. I actually prefer your first render of this wallpaper. The new one although pretty, it's a little to busy for my likeing. But as always it's been added to my wallpaper collection anyways, because I love your work. Thanks Ryan. I spent the weekend rebuilding my broken "Neptune's Garden" scene and have posted the updated render in my Members Gallery this morning. The first change you will notice is the new title: "An Octopus's Garden" is borrowed from one of my favorite Beatles songs. My scene file was corrupted before I had the chance to add much in the way of sea life, so I had to choose a different title for the first version (which will remain in the Pickle Jar). Some nice orange and red fire coral could be added as well as some unique brain coral and anemones. Another fantastic work piece! Perhaps we could see a sunken ship image in the future. Perhaps some larger fish could be added to the image such as tarpon, barracuda, or some nice colorful fish. Hands down, one of your best wallpapers ever! This instantly takes me back to snorkeling of the coast of Sharm El Sheikh, Egypt. I feel your pain with the software crash...hope you get it sorted out. Can't wait for the dual screen! I am using Poseidon right now, Neptune's Garden is how I want my marine tank to look! I like it so far, but I think something should be eating something else here, or at least struggling with it. not sure whether your really NEED anemones & clown fish, as everyone would expect to see this on such a picture since finding nemo. Being a marine aquarist for the past 20 yrs I would like to offer some suggestions. You need some schools of fish, like yellow tangs or anthias. Would be very cool if you could put some anemones & clown fish in the mix. The corals on the left are pretty washed out also. It's still very impressive Ryan and I hope you can make it even better. Enjoying this one already. Needed a respite from winter. Love the sun rays coming in, feels very warm. Suggestion... possible to do a little less blue in the coral, tends to wash out everything into a blue blob at times. Hope you are able to get the tech issues worked out. You never cease to amaze. You also make me want to spend more money and buy Vue among other things. Thanks for all the great images after all these years and keep it up! Love the orginal. This one is nice. But too many pastels. A little too Disney. I encourage you to pursue your changes. I look forward to them. I have always love your underwater renders and this one doesn't disappoint either. Great Job!!!! This is absolutely beautiful. Being in the North East where it's starting to get cold this is a great view to have on my computer. Aquamarine has always been an all-time favorite of mine and finds it's way on my desktop over and over for extended periods. Neptune's Garden (2011) might now take its place as my favorite underwater wallpaper. I really, really love this. Please don't change it too much... It feels real. First off, let me say I've always wanted to go scuba diving, so being from a land-locked state, pretty hard to do, so all of your underwater scenes make me feel I'm right there. Second of all, if this is only a first draft, I can't wait to see the next versions!!! Awesome job, Ryan! My bad on that previous post. I didn't really read about what happened to the render until after I posted. Sorry. 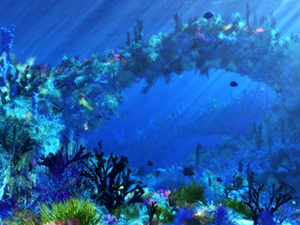 I like this one but I think there's a bit to much coral growing around the arch. It also kinda grows off at weird angles that makes it look less natural. Other than that its pretty nice. Maybe add more fish too. My condolences on the Vue bug that corrupted your scene file. Reminds me of the reef in OZ, its true though about the colours - below a couple of meters you lose reds and yellows the last colour to go is the blues. It upset me to learn that Nemo is actually brown and not orange! I'd say don't paint too much back in it won't look right. So, 80% + 19% = 99%... I guess a true artist admits he never makes it to 100! I do think this is a well-usable image, even as it is. I really love the way the light filters down through the water, but I have to admit, the grouping of coral on the left side looks a bit washed out. Not sure if that was part of the 19% you were still working on, but hopefully the people at E-Onsoftware can help you. Good luck with it! Spending a week in the Bahamas. I need some time near the ocean. This is a great image.